The goals of Canada's New Infrastructure Plan are not just to grow our infrastructure, but at the same time to harness new and emerging technologies to make it cleaner, greener and smarter. For the government's hallmark policy to date -- the Innovation Agenda -- we hear the consistent message that we need to support the people that innovate. 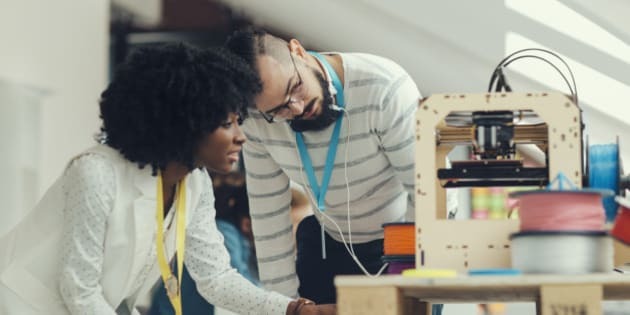 Creative Multi-Ethnic start-up business team working by 3D printer. Standing and looking at 3d printer and printed object. Male with headphones is looking at printed object in 3D printer. They are wearing name tags. Canada's economy is inextricably linked to our infrastructure -- and it's always been so. Our nation and its economy would have developed very differently were it not for the construction of a transcontinental railway just fourteen years after Confederation in 1867. On the eve of Canada's 150th anniversary, the country and the economy look vastly different than they did in 1881 when the first trains rolled from Montreal to British Columbia, by way of Kicking Horse Pass. However, what is similar today is that we are on the verge of yet another pivotal moment in our nation's infrastructure history -- one that is sure to again shape our future economy. This time, it's not the agrarian economy, but the innovation economy that will create wealth for all. The federal government has demonstrated its commitment to infrastructure growth by dedicating nearly $190 Billion over the next 10 years to its New Infrastructure Plan , with priorities centred on communities and transportation. The goals of Canada's New Infrastructure Plan are not just to grow our infrastructure, but at the same time to harness new and emerging technologies to make it cleaner, greener and smarter. For the government's hallmark policy to date -- the Innovation Agenda -- we hear the consistent message that we need to support the people that innovate. The message needs to be the same for developing Canada's infrastructure talent, because just as it's people who innovate, it's also people who build. So where will Canada's next generation infrastructure talent come from? In particular, if there is a focus on infrastructure that is clean, green and smart, much of the talent is already being developed at Canada's polytechnics, colleges and institutes of technology. Across Canada, polytechnic institutes are training the next generation of "green collar workers" with a hands-on model of education. In Alberta, NAIT is building the talent that will maintain Canada's clean transportation infrastructure. Partnering with SAIT and BYD, a leader in battery technology and zero-emissions, NAIT and SAIT will deliver world class training for certifications in the maintenance of Heavy Duty Electric Vehicles. In Ottawa, Algonquin College is training tradespeople for the green economy in the Algonquin Centre of Construction Excellence -- a sustainable, highly energy efficient, "living lab," complete with green roof, 22 metre high biofilter living wall and a Platinum certification from the Leadership in Energy and Environmental Design (LEED). What better way to learn green than to live green? In Vancouver, BCIT's Smart Microgrid is revolutionizing the way clean energy is delivered. Incorporating renewable energy sources such as wind and photovoltaic solar, the Smart Microgrid is a small-scale version of a traditional electricity system that is deployable in a range of locations. It has sparked its own research program, in partnership with government and industry, that is testing and verifying the technologies and regulations required for Canada's future smart grid. Though Canada looks like a very different country today than it did in 1867, high quality infrastructure that serves the needs of the people is the backbone of this country. That "backbone" is certainly more than the steel tracks, iron spikes and wooden ties we started with. Today zero emissions vehicles, green and energy efficient buildings and innovations in "off the grid" delivery of energy are what's necessary for Canada to succeed in the new global economy, in the same ways it succeeded for the previous 150 years. A 21st century economy requires the support of 21st-century infrastructure, and its Canada's polytechnics that are delivering the talent to build it. Nobina Robinson is the Chief Executive Officer of Polytechnics Canada, a national alliance of Canada's leading polytechnics and colleges. Dr. Glenn Feltham was appointed President and CEO of the Northern Alberta Institute of Technology in 2011. Under Dr. Feltham's leadership, NAIT plays an essential role in strengthening Alberta's and Canada's economies through hands-on, technology-based education and applied research in partnership with industry.